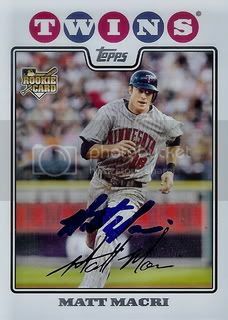 Matt Macri made his Major League debut back in 2008 for the Minnesota Twins. He's still with the Twins organization but hasn't made it back to the big leagues since. Woohoo! 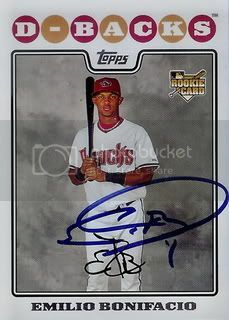 Another signed card of an Arizona Diamondback. This one is from current Florida Marlins minor leaguer, Emilio Bonifacio. You may have noticed that the number of blog posts is down dramatically this month. 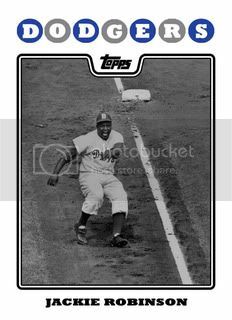 This isn't due to a lack of cards to post about, I have plenty of those. It's really just a lack of motivation. I have been pretty diligent in getting posts these past 16+ months but I guess I had to fall off the wagon sometime. Here's another card sent to us by blog reader Dan. Dan sent this over back in February when Fredi Gonzalez still had a job. Thanks, Dan! Hi again. Ten days have passed since my last post. That's the longest span since in this blog's history. Back at it today with Ricky Nolasco. Picked this one up from a friend on SportsGraphing.com after Spring Training. Why Jackie Robinson? K'mon, you really have to ask? 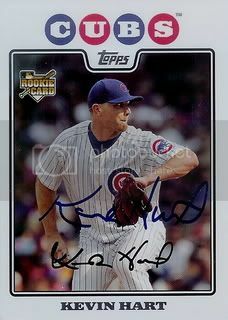 Kevin Hart also signed an Opening Day card for us. The red border goes nicely with the Cubbie blue and pinstripes. After beginning his career with the Chicago Cubs, Kevin Hart is now with the Pittsburgh Pirates. He was traded last season in the deal that brought Tom Gorzelanny to Chicago. He is currently assigned to the Pirates Triple A team ( the Indianapolis Indians ). 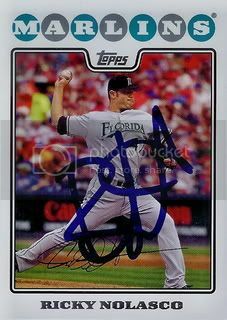 Here's another player currently on the Norfolk Tides roster who signed a card for us. 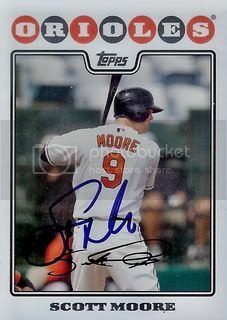 Scott Moore, who began his career with the Chicago Cubs, is now with the Baltimore Orioles organization. 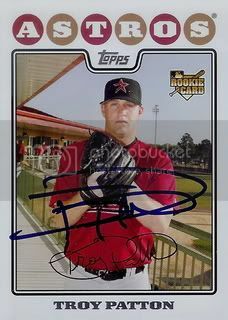 A friend on SportsGraphing.com who's home team is the Norfolk Tides got Troy Patton to sign his 08 Topps card for us. In case you were wondering, the Tides are the Triple A team for the Baltimore Orioles. 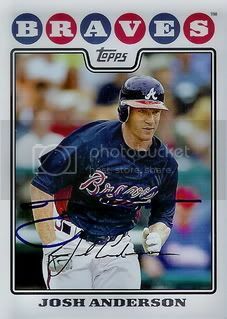 In addi tion to Josh Anderson's card from the 08 Updates & Highlights set, Dan was able to get our Opening Day card signed. 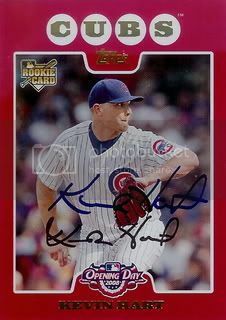 It's always great to get another signed Opening Day card to compliment our 08 Topps collection. When I got home from school my dad was watching this game. It was probably in the fifth or sixth inning. 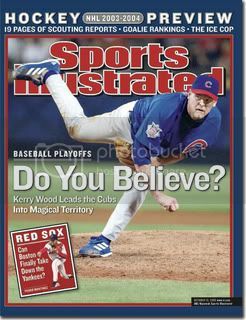 We watched the final few innings together as Kerry Wood continued to mow down the Houston Astros batters. An ordinary tuesday night early in the Diamondbacks season gave us a glimpse of what was to come later that Fall. I remember the questions of whether or not this would count since the game was tied at the end of the ninth inning. Any way you look at it, Randy Johnson's performance was magnificant. The Diamondbacks overcame some bad luck in New York to bring the World Series back to Phoenix. They demolished the Yankees in Game 6 to force a Game 7. 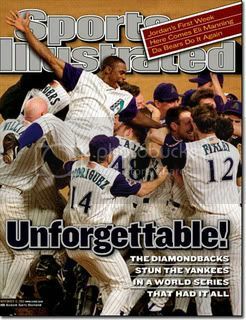 Tony Womack, Jay Bell, and Luis Gonzalez helped defeat the mighty Yankees and Mariano Rivera in the ninth inning. Most of the cards I've been posting about lately came to our collection with some help. I haven't sent many TTM requests this season but that's about to change. Today's card is another that Dan from SweetSpotGraphs.com helped us out with. It's of Josh Anderson. Josh has moved around alot in his brief career. 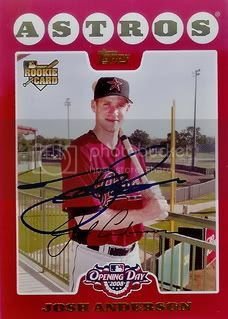 Since his MLB debut in 2007, he's played six organizations ( Houston Astros, Atlanta Braves, Detroit Tigers, Kansas City Royals, Cincinnati Reds, and Milwaukee Brewers ).